This week marks the 45th anniversary of the first manned airdrop of the BMD-1, a Soviet infantry fighting vehicle which has proven durable, adaptable and has spawned a number of successors. In honor of the occasion, military observer Andrei Kotz takes a look at some of the best modern airborne armor in the inventories of the world's armies. On January 5, 1973, the Soviet Army successfully dropped the BMD-1 out of an Antonov An-12 turboprop transport from 800 meters with a two-man crew onboard in drills in central Russia. 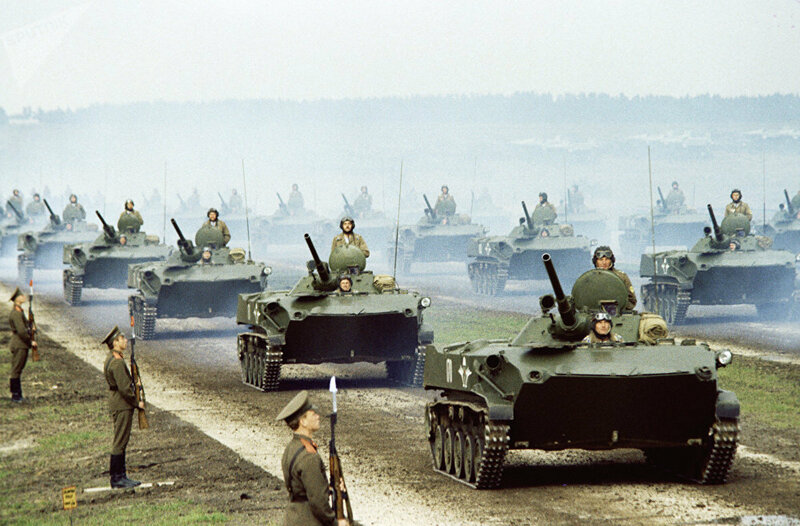 In the Soviet era, generals planned for massive assaults involving entire divisions' worth of airborne troops. But although the Cold War and the USSR are now both things of the past, Russia remains the only major military power with significant armored airdrop capability. Field review of troops and military equipment during the Zapad-81 wargame, including the BMD-1 IFV. According to RIA Novosti military observer Andrei Kotz, Russia's inventory of paradropped armor is rightly considered the most extensive in the world. "No other country has such an assortment of airborne armor," the analyst wrote. Russia's latest amphibious tracked IFV, the BMD-4M, continues to fill the Russian army's ranks, replacing the BMD-1 granddaddy and its successor, the BMD-2. The 13.6 ton vehicle is equipped with a 100mm rifled cannon and a 30 mm autocannon, along with coaxial 7.62mm machine gun, and has a number of features, including its turret, which can also be fitted on the BMP and BTR series of IFVs and armored personnel carriers. The vehicle's 100mm tank gun can fire the Bastion anti-tank guided missile (ATGM), loaded internally, unlike ATGMs carried by other IFVs, enabling it to destroy targets from a range of up to 5.5 km. The Russian 'flying tank' has a three-person crew, and its landing compartment can carry up to six passengers. The vehicle includes automatic fire control and the s double-axis stabilization system, enabling the IFV to fire on the move. Its thermal imager, night vision, and laser range finder improve its ability to find targets. On the battlefield, the BMD-4M would be complemented by the Sprut-SD, an 18 ton self-propelled tank destroyer/light tank fitted with a 125 mm smoothbore gun, the same gun used by T-72 and T-90 main battle tanks. The Sprut-SD's gun allows it to take on even the heaviest enemy armor. For artillery support, Russian airdropped armored formations would turn to the Nona-S self-propelled howitzer, which has a 120-mm mortar with a range of close to 13 km. Rounding out the airborne armor contingent is the BTR-MDM Rakushka, the new armored personnel carrier based on the BMD-4 platform tasked with delivering infantry to the front. Kotz explained that "like the BDM, the Rakushka is welded together from sheets of aluminum armor, can swim, and traverse rough terrain. On the highway, the APC accelerates to up to 70 km per hour, and can carry 13 paratroopers up to 500 km without refueling." 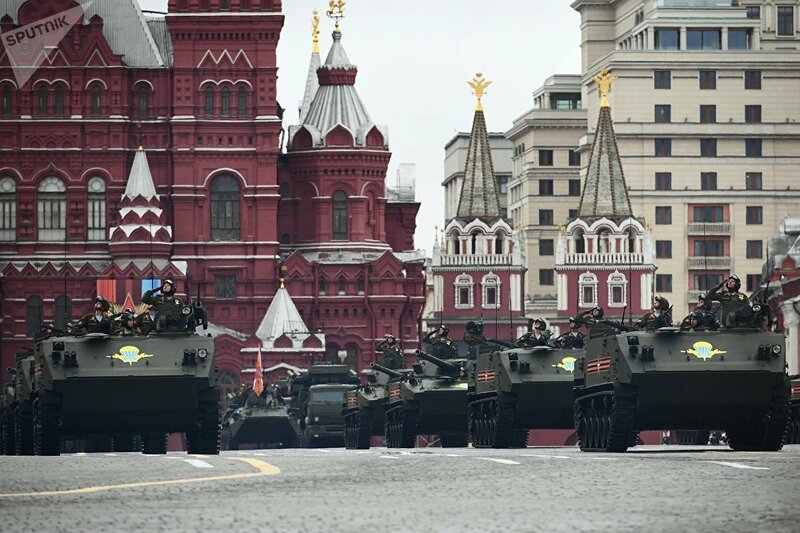 BTR-MDM Rakushka armored personnel carriers during the Victory Day Parade on Red Square. All of the above systems can be dropped from between 400 and 1,500 meters, with crew or without, by transport planes flying at speeds of between 300 and 350 km per hour. After the drop, the vehicles can be brought to a state of readiness in a matter of minutes, owing in large part to their manned drop capability. According to Kotz, while the People's Liberation Army's airborne corps have several combat vehicles potentially suitable for airdrops, "open sources have information on only one airborne IFV, the 8 ton ZBD-03, adopted in 2003." 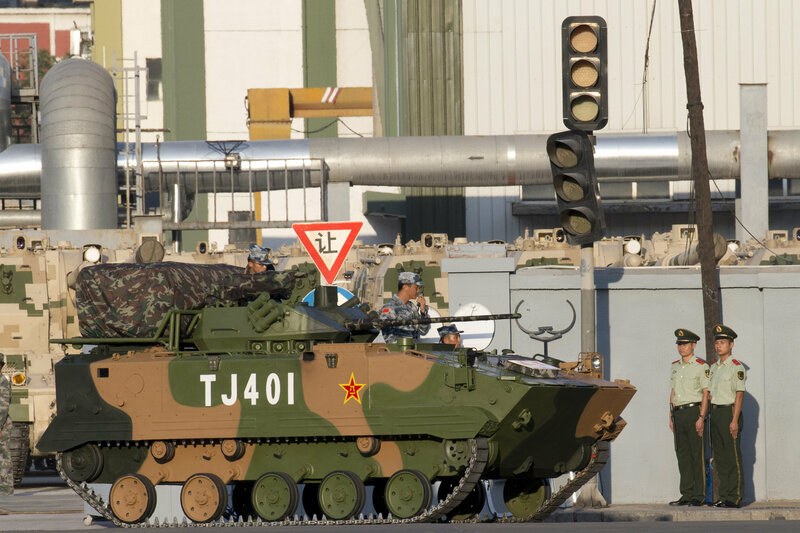 The Chinese system features a 25-mm main gun, a copy of the US M242 Bushmaster,a y7.62 mm twin machine gun, and China's HJ-73C anti-tank missile system. The ZBD-03's armor is designed to withstand both small arms fire and fragmentation, and features the traditional steep sloped armor common on Soviet and Russian vehicle designs of this class. The ZBD-03 is transported and dropped by the Il-76MD heavy cargo plane (of which China presently possesses about 20). Each plane can carry up to three of the vehicles and their crew to their destination. According to media reports, the PLA is presently testing a new modification of the vehicle fitted with a 100-150mm main gun, possibly in a nod to Russia's Sprut-SD anti-tank gun. For a country that has engaged in so many overseas conflicts over the decades, the US has surprisingly few armored vehicle designs to back up its airborne drop capability. As Kotz pointed out, "US paratroopers today can paradrop only light armored vehicles such as the 2.6 ton Humvee, the 960 kg LSV and the 6.4 ton L-ATV, as well as the British-made M119 105mm towed howitzer. The vehicles are usually fitted on special platform pallets, and literally pushed out of C-17 and C-130 transport planes' ramps" onto the ground. According to the military observer, "the US has been without a real armored system suitable for airdrop since 1997, when the M551 Sheridan light tank was withdrawn from service." That system, produced in the mid-to-late 1960s, featured a number of groundbreaking technologies for its time, including aluminum armor, a 152mm gun firing guided Shillelagh anti-tank missiles, and more. The vehicles were used in the US war in Vietnam, although they were usually transported by helicopters. The Pentagon has considered General Dynamics Land Systems' Stryker Mobile Gun System as a replacement to the Sheridan. That wheeled armored platform weighs 18 tons, has a 105 mm gun, and can be modified for airdrop. However, according to Kotz, "it's unlikely to serve as America's answer to the BMD-4. In 2016, General Dynamics presented its prototype Griffin light tank, on whose basis a new airborne platform is being created." Rounding out the handful of countries with domestic airborne armor technology is Germany, whose 1st Airmobile Brigade has the distinction of having in its possession the lightest airborne tracked vehicle in the world: the 2.7 ton steel armor Wiesel Armored Weapons Carrier. Offering protection against small arms and fragmentation, the Wiesel is about the size of a small van, can be configured to carry a variety of weapons, and accelerates to up to 80 km an hour on the highway. The system's fire support variant is fitted with a MK 20 Rh202 20 mm autocannon, while the anti-tank modification launches TOW missiles. Other, less common configurations include self-propelled mortar system, reconnaissance vehicle, armored ambulance, anti-aircraft missile system, etc. "One can only marvel at the resourcefulness of German designers, who managed to achieve such a variety of options on such a tiny platform," Kotz wrote. The Weisel can be paradropped, or carried via helicopter, including the Luftwaffe's CH-53 and CH-47.